Often, it’s the small things that catch my attention and cause me to wonder how much – or little – we’ve really changed over the decades and centuries. Modern cities like Missoula pride themselves on their arts, culture and economic development, as well they should. Sensational murders and other depravities still generate brief headlines, but tend to quickly fade from memory and rarely, if ever, make the pages of our history books. Still, it’s instructive to know our past – all of our past. What follows, then, is a snapshot of life in Missoula in the summer of 1894. Her given name was Adeline Patenaude. 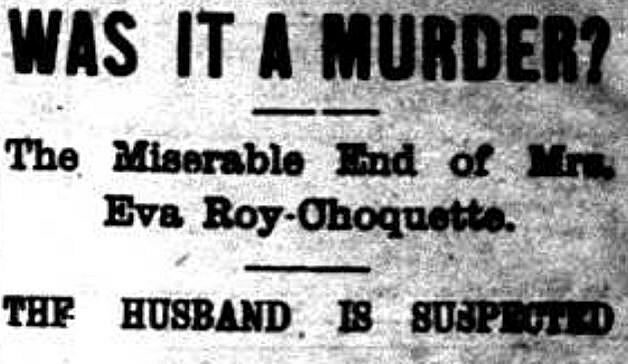 But in Missoula, the French Canadian from Quebec was known as Eva Roy. Eva became a notorious prostitute – a veteran resident of the city’s houses of ill fame. As such, she had her share of run-ins with the law. But, it was her longtime relationship as the paramour of another scoundrel from the prescribed district that proved to be her undoing. Roch N. “Roxie” Choquette (the referenced scoundrel) was a pimp and a drunk who just couldn’t stay out of trouble. In fact, he seemed to go out of his way to cause problems. One night, Roxie was arrested and jailed for a disturbance in the red light district. The next morning, he bailed out, only to promptly walk into the Florence Hotel and disrupt a gathering of prominent gents enjoying a game of billiards. 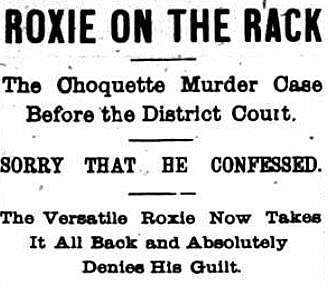 Choquette’s troubles with booze and the law escalated to the point that he was about to be jailed for vagrancy. His paramour, Eva Roy, decided to rescue him. She married him and said she’d support him. Roxie became jealous every time Eva left the house to spend an evening in the prescribed district. Upon her return, he would beat her black and blue. In late June 1894, Eva was beaten worse than ever. She remained in the house for days, unable to move. When Roxie finally took her to the hospital, she was barely breathing. She soon died. Roxie – drunk as usual – claimed Eva fell down the stairs, but no one believed him. He was arrested and charged with murder. Sober, a week later, “under the careful direction of Sheriff Ramsey and his deputies,” Choquette confessed. Choquette later recanted his confession claiming he was stressed out, his mind “badly deranged” by his forced sobriety in jail. 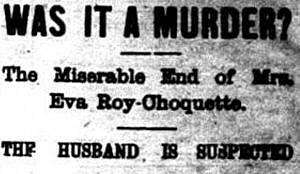 The murder trial was scheduled for August 1894, and proved extremely popular. It seemed everyone in town wanted to be on the jury; it took less than an hour to fill the panel. 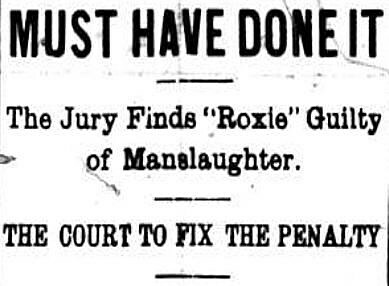 Roxie took the stand, “reciting the well-remembered disgusting details of the days prior to the death of his wife,” and flatly denying he killed her. That proved accurate. The jury quickly pronounced Choquette guilty, not of murder, but of involuntary manslaughter. Judge Woody, in sentencing Choquette, mirrored the view of the jury – that Roxie had probably not intended to murder his wife, but certainly contributed to her death by his “beatings and inhuman neglect.” He gave Choquette five years in the state pen at Deer Lodge. But it was the ghost of Eva Roy who got the final word. In life, she had fallen behind in paying rent on a property she had been using for “immoral purposes.” Now, from the beyond, one can imagine her hovering and watching, as another judge in a separate courtroom, ordered Roxie to settle his wife’s debt, and pay the landlord $40. So, there you have it – a small snippet of real life from Missoula’s past, a sensation at the time, promptly forgotten, and lost to history.